One of the most remarkable features of Valentine's Day is the culture of gift-giving. Flowers, especially roses, are thought to be a must for Valentine's. 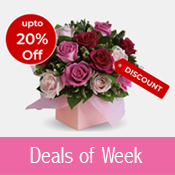 In this page, we will look at what are the best gifts that can go along with flowers as good Valentine's Day gifts. Chocolates: Roses and chocolates or roses and candies are a famous combination of ValentineÂ’s Day gifts. This is supposed to be some gift that is very likely to be taken for granted if presented with and missed if not given. 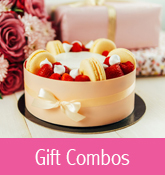 The chocolates that go with the flowers are ideally given in an attractive gift basket. Valentines Day card: Sometimes one more thing can supplement the Â“chocolate & rosesÂ” combination. It is a Valentine's Day card, which is also a very common Valentine's Day gift category, thus making the gift consist of three parts. 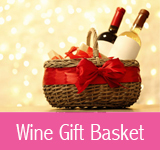 Similarly it is possible to add one more item - say, wine Â– depending on the recipient's preferences and attitudes. Yet another possibility is to go for a gift that has, in addition to flowers, all edible items, namely chocolates, strawberries, and wine. 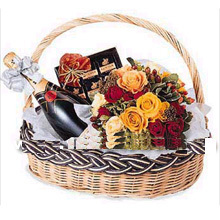 An Alcoholic Beverage: An alcoholic beverage like champagne can also add to flowers. Flowers and champagne would convey the idea that you are in a major celebratory mood. Write-Up: There are certain things that are eternally sweet. For instance, a well-written poem or a love-letter with detailed attention to the appearance of the material on which it is written. Such a write-up, because of the personal care and love it announces, can be a perfect complement to the flowers. A Romantic Dinner: A romantic dinner is a perfect addition to a lovely bunch of flowers. Some people appreciate a home-cooked dinner a lot more than a dinner at a restaurant. Present your beloved with home cooked dinner along with an exquisite bunch of roses or lilies (do not forget to include her favorite dish), you are sure to have won her heart. Cuddly Toys: For the lovers of cuddly toys, a recommended gift item to accompany red roses is a Teddy Bear. The flower arrangement is a perfect addition to the cuddly toy bear which got its name from Theodore Roosevelt, the American president at the turn of the twentieth century. Jewelry: Flowers go well with jewelry. A gold necklace with a diamond pendant is a very good supplement to a set of flowers. Heart rings made with sterling silver can also go superbly with Valentines Day flowers. An ideal gift for gadget lovers would be a combination of some latest gadget and a number of flowers arranged beautifully. Others:Moving to music, arts, and literature, there are some nice gifts that go with flowers. A nice instance would be a book of romantic verse from Shakespeare down to Vikram Seth. DVDs of music that your Valentine enjoys and flowers are by all means, a brilliant gift set. Obviously, in this set comes paintings too. Claude Monet's painting, Â“Japanese bridgeÂ” is very good object to partner a collection of red roses.